Srixon har vært på markedet i mange år. Stadig kommer det nye baller. Utviklingen går sin gang. Her er siste skrik på markedet. Nå kommer Srixon med den nye Srixon UltiSoft. Som navnet sier er dette en myk ball. Den skal gi en bedre følelse ikke minst på og rundt greenene. Srixon Sports Europe Ltd. 9th Febuary 2016 is excited to announce the launch of an all-new golf ball which it claims to be its softest ever. 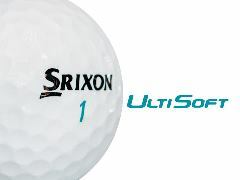 The Srixon UltiSoft delivers a soft touch and feel like never before. The most innovative soft core in the industry produces softer feel on all shots from tee to green and maximises energy transfer for that game–winning greater distance. Srixon`s expert R&D and design team spent over two-years developing the most advanced two piece ball availabe. The UltiSoft delivers the ultimate soft feel and elevates 2 piece ball performance to the next level. Designed specifically for low to mid swing speed golfers who are looking for the ultimate in feel, the UltiSoft features Srixon´s propriety E.G.G. core, thin ionomer cover and 324 speed dimple resulting in advanced performance in terms of Distance, Control and Feel. THE SRIXON ULTISOFT will certainly be the hottest low compression ball for 2016. Ultimate Feel, great distance and superior greenside performance!